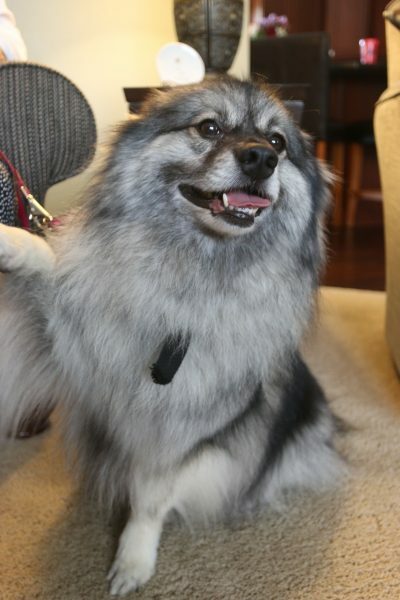 Gracie joined the Tucker family as a fluffy, little lovable fur ball, one in which could be quite curious if not given proper training and a purposeful duty. 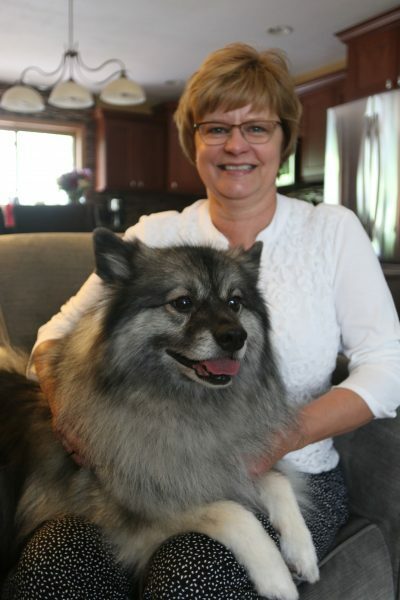 So Deb Tucker, Gracie’s owner, set out to make her new Keeshond puppy more than a family pet by enrolling her in pet therapy training through Pet Partners. “My sister-in-law is a social worker for a hospice in the St. Cloud area, and she asked if I’ve ever thought about volunteering with Hospice. That was about the same time we got Gracie. I thought pet therapy would be a great way I could pair with Hospice,” Deb said. After they obtained certification and connected with Hospice of the Red River Valley Volunteer Coordinator Steph Baker, Deb and Gracie started visiting hospice patients right away. In five years, the pair has been matched with 30 hospice patients—making visits to as many as 11 patients at a time. 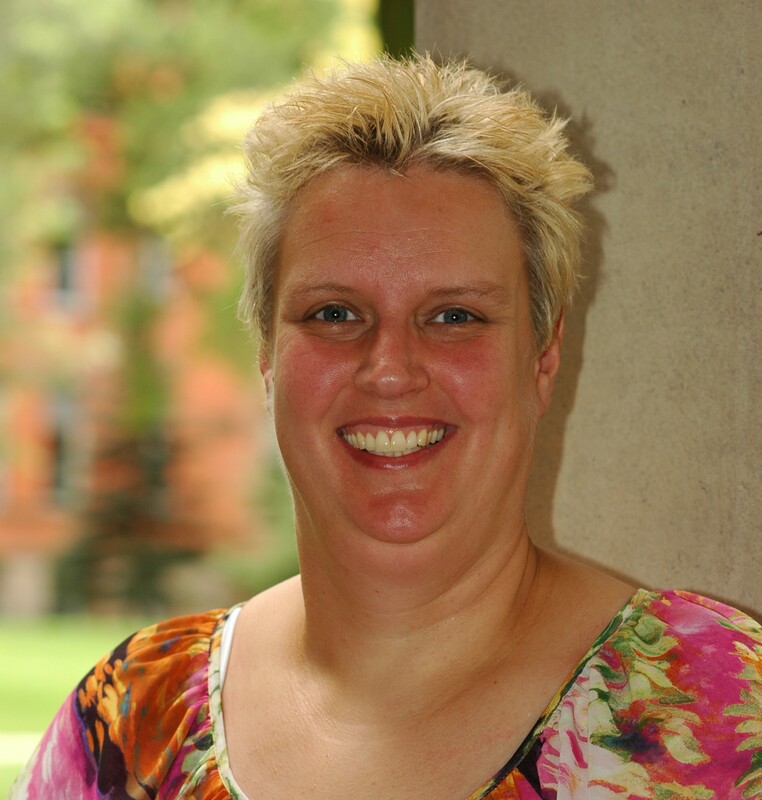 “I work full-time, but we do what we can, when we can,” Deb shared. “I think both of us have gained so much from it, and Gracie just loves it. “Gracie, do you like to go to work and visit?,” Gracie’s ears perk right up with excitement! Together, Deb and Gracie see patients wherever they call home, including private residences, nursing homes and assisted living facilities, from Detroit Lakes to Lake Park and Frazee. Prior to each visit, Deb makes sure Gracie is well-groomed by cleaning her eyes, brushing her hair and clipping her nails. During their very first hospice visit, Deb knew it was kismet. “I was kind of nervous because I didn’t know what to expect. The gentleman was sitting in the common area of the assisted living facility, and when he saw us his face just lit up. He put his hands around Gracie’s face and talked to her. We were there for a long time. He didn’t want us to leave. When we were leaving, he got up and tried to follow us, and he hadn’t moved like that in quite some time. I knew it was meant to be,” Deb explained. Gracie’s ability to connect with people on the hospice visits has amazed Deb. There was one gentleman in particular who Gracie would not leave his side, even when she was getting too warm. For the most part, he was non-responsive, but as Gracie lay with him, he opened his eyes and began petting her. During another visit with the same patient, the patient’s family was present, and one of his daughters was having a hard time. When the pair arrived, Gracie went right to the daughter because she knew that the daughter in the room needed her most. The duo also visits a patient who recently had a stroke, and because of that, she can’t use her right side. During a visit, her wheelchair was covered on her left side, so Deb attempted to take Gracie to the right side of the chair. Instinctively, Gracie would not go on the right side because she knew the patient couldn’t pet her there. 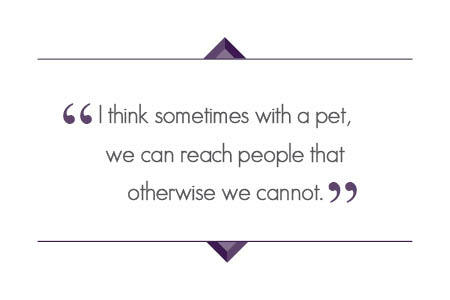 “I think sometimes with a pet, we can reach people that otherwise we cannot; Gracie is a natural go-between. And if they don’t want to talk or can’t talk, they can just pet her and feel that soft fur,” she said. As for Gracie, she loves her role as a Hospice volunteer. “What a better job for a dog than to get attention,” Deb said. “Gracie is not a cuddler, but she does cuddle with people at the end of life.” Volunteering for Hospice of the Red River Valley has provided benefits not only for Gracie, but has also enriched Deb’s life. “This has been an invaluable experience for me, I tell people it’s taught me a lot more about living and not taking things for granted. I think sometimes patients can say, ‘I’m not feeling good today,’ when sometimes they can’t say that to their families. I get so much satisfaction and joy knowing I am making their end-of-life journeys a little better,” Deb explained. Throughout her involvement with Hospice, she has formed strong friendships and gathered numerous heart-felt stories along the way. Recently, Deb’s volunteering contributions were recognized by the United Way of Becker County with the United Way Everyday Hero award. And as much as that award meant to her, she’s driven to keep continuing to give back because going into people’s homes and having them sharing their lives with her has been the most rewarding part about volunteering. Deb also feels compelled to educate and recruit more people to volunteer. “I think almost anyone could be a Hospice volunteer. 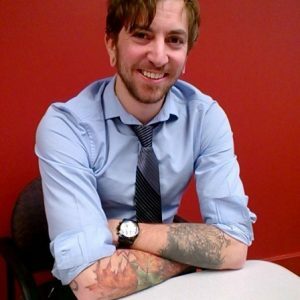 Hospice is really good about working with your schedule. They need lots of people of different ages to go visit. You can go read, visit and you get to develop great relationships. It’s not just a doom and gloom situation, and you learn so much through the experience,” Deb said. For Gracie, the cuddly snuggles, treats and new leash every time she passes her recertification test are reward enough.